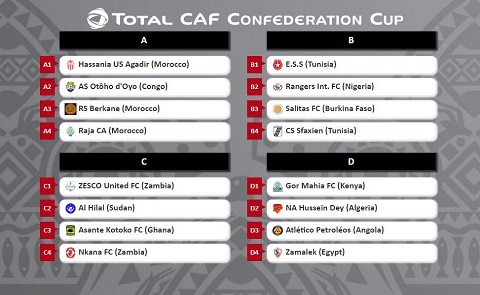 Kumasi Asante Kotoko have been handed two Zambian opponents and another from Sudan in the CAF Confederation Cup group stage draw held in Cairo on Monday. CK Akonnor’s side will visit Zambia twice to face Zesco United and Nkana FC, with Al Hilal Omdurman of Sudan completing the draw in Group C.
Kotoko qualified to the group stages of the competition for the first time since 2008 after beating Kariobangi Sharks of Kenya and Coton Sport of Cameroon in the qualifying rounds. Zesco United, the 2018 Zambian Premier League Champions, made it to the Confed Cup group phase after beating South African side Kaizer Chiefs 5-2 on aggregate following their elimination from the CAF Champions league by TP Mazembe. Nkana FC beat San-Pedro 3-0 on aggregate to make the group phase while Al Hilal beat Mukura FC 3-1 on aggregate to progress. The group phase of the CAF Confederation 2018/2019 will start on February 1.